WASHINGTON DC â€” Zimbabwe joined the international community on Monday in commemorating World Malaria Day. 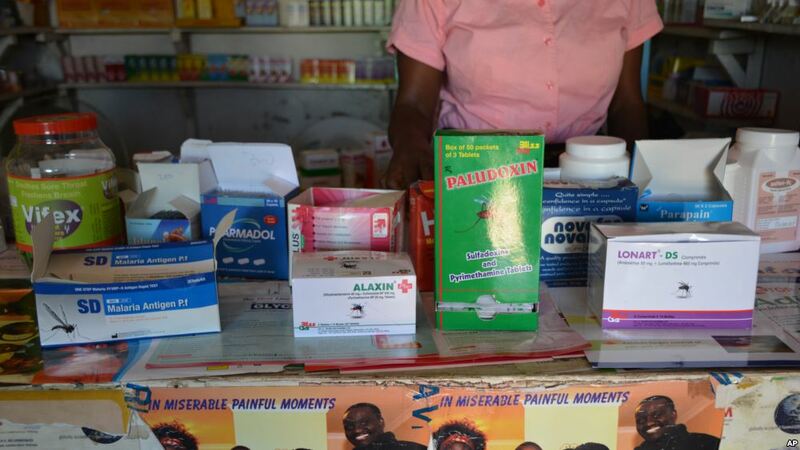 Malaria drugs are seen on display in a privately-owned pharmacy. Experts say malaria is a major health problem in Zimbabwe with 50% of the population at risk, although its epidemiology varies in the different regions of the country, ranging from year-round transmission in the lowland areas to epidemic-prone areas in the highlands. Dr. Trymore Sithole, a Zimbabwean medical student based in Algeria, told VOA Studio 7 that local people, including youth, play an important role in contributing in the fight towards ending malaria. The World Health Organization (WHO) estimates that there are more than 400,000 malaria cases among all age groups each year in Zimbabwe. Sithole said there is an increase of mortality deaths in rural areas due to inaccessibility to hospitals. He suggested various ways of preventing malaria. â€œ â€¦ Getting rid of mosquito breeding areas. Use of insecticide-treated mosquito nets and indoor residual spraying, use of mosquito coils and repellents, covering yourself. (The) Drug prophylaxis can also be used, especially for people travelling to endemic areas, pregnant women and children. According to the Presidentâ€™s Malaria Initiative, a United States initiative, Zimbabweâ€™s malaria program receives support from some donors, including the Global Fund to Fight AIDS, Tuberculosis and Malaria (Global Fund). The United States Agency for International Development provided targeted support to Zimbabweâ€™s National Malaria Control Program through an emergency round of indoor residual spraying in 2009 and in 2011 with a procurement of malaria commodities. Prior to 2011, other malaria donors included the United Nations Childrenâ€™s Fund, the United Kingdom Department for International Development, and the European Commission. Zimbabwe is expected to get at least $14,5 million from the Presidentâ€™s Malaria Initiative this year with funds to be channeled towards various programs including the provision of insecticide-treated nets, conducting indoor residual spraying, and several others. Within the next four years, six nations in African regions where malaria is most prominent could be free of the disease, the World Health Organization, said in a report published Monday to mark World Malaria Day. The six countries in Africa that could be rid of malaria by 2020 are Algeria, Botswana, Cape Verde, Comoros, South Africa and Swaziland. WHO says malaria infection rates are falling thanks to the use of insecticide-treated bed-nets, regular bug spraying inside dwellings and rapid diagnostic testing, though these techniques are becoming less effective as time goes on. While the outlook is promising, the group cautioned that nearly half of the world’s population around 3.2 billion people are still at risk of contracting malaria. Just last year, 214 million new cases of malaria were reported in 95 countries. More than 400,000 people died from the disease. The report says 9 out of ten deaths from malaria in 2015 came from sub-Saharan Africa. Moving forward, the WHO said new technologies will need to be developed to deal with the disease and the fight will require strong political commitment and financing from governments. “Reaching the goals of the “Global Technical Strategy” will require a steep increase in global and domestic funding – from $2.5 billion today to an estimated $8.7 billion annually by 2030,” it said. Zimbabwe returning to the international stage?